Friends invited us for dinner last night and at the last minute, I decided to take my camera. I'm VERY glad I did! This was taken from their deck. Only two more nights on the island so am treasuring the sunset opportunities. Tried to learn to layer in PS today using Lynda tutorials. The tutorials are great but oh my gosh, it's complicated! I have total admiration for all of you who are able to use this system/tool! Update: Noted as one of Ross' "Photographic Highlights of 2015"! Wow this is amazing ... what a sight to behold..
What a MAGnificent capture!!! WOW oh WOW!! Beautiful capture with a nice frame. Lovely colors and detail! Fav! Gorgeous light rays and colors in the clouds. This is just breathtaking!!! It makes you sigh!!! FAV! This is beautiful! I love the framing and silhouette .. and the rays ... oh my. Fabulous colours, great framing. Layers are actually very simple once the penny drops. They are also such a powerful tool to have at your disposal. Marvellous light rays and conifer silhouettes. Looks a wonderful sight tAffy. Good heavens this is awesome. fav. Cannot believe how fast time flies and that you are almost due to leave the island. wow Taffy this is gorgeous!! Love the framing! So glad you took your camera - what a wonderful shot! This is wonderful shot Taffy. Your pictures are awesome. Fav. I'm struggling with layers too. I can use PS if some kind soul has told me exactly what to do. Trouble is I don"t always understand what I've done and that is so frustrating. I like to learn from what I'm doing so I try to keep adding to the little bits I do understand. Another outstanding capture, Taffy. Instant fav. I do not have the patience to read tutorials and sometimes I don't even understand what they are talking about. I experiment on my own and very often, like Joyce, I forget how I did something I liked. This is awesome! Instant fav! What an awesome sky! Lovely tree silhouettes too. What a spectacular image! I love the natural framing,and the color is amazing. Another WOW for me - instant fav. Would have been a shame to miss THAT! The colours are just absolutely gorgeous, and the silhouettes! fav! Hello Get Pushed partner. My challenge for you this week it to take a picture through a window where the subject on the other side, and the reflection are both elements of the image. Simply stunning! !Those light rays are so beautiful!! FAv! Wow this is super Taffy, love how the dramatic sky is framed by the greenery and the way those crepuscular (?) rays echo the branches of the conifer. Big fav! Wow you had a awesome sunset, love the rays of light spreading out from the cloud...............I like the tree in the foreground. Very pretty- especially with the trees framing the entire edge of the picture. @stephomy Thanks for the get-pushed challenge. I'll have to give this some thought! @jgpittenger Mmmm...maybe we could do a screen share sometime soon and you could walk me through a few basic things. I'm getting a little discouraged from being overwhelmed by the detail in the tutorials. Let me know what days might work for you (although with the move, for me it's probably tomorrow afternoon or sometime in the subsequent week as we leave Tuesday and it will be insane for about a week for the move-in. @jgpittenger Will send you an email...thanks! 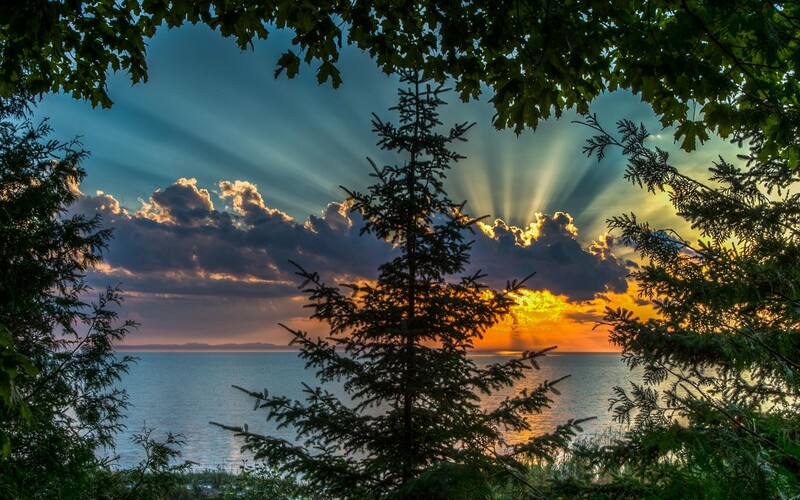 Wow, fantastic capture of a magnificent sunset! Such beautiful colours. And the rays above the cloud! Interesting hoe drastic the difference is between the parts below and above the clouds. Taffy, this is just stunning! Those rays of light radiating from the clouds — those are spectacular. Well you've saved me a few minutes on Friday finding out who is number one on TT... I'm looking at it right now- Fav! @vignouse I'd be ecstatic if it landed there! But happy just to make it to TT! Thanks for your kind thoughts and comment! Layers take practice and for me became easier because of scrapbooking that is all about layers. But it is the true strength of PS as lightroom is not destructive layers do not destruct the original or other layers. Understanding what you can do, blend modes and the importance of the way things are layered all takes time. And then adding mask to the layers so the affect of the layer with the mask only affects the places you want is so very important. Keep trying because you will be in love with it. FAV -- spectacular processing to show off that sunset, beautiful framing, and memorable image! @taffy Told you so, but I looked to confirm it anyway... congratulations! No 1 on TT!! No surprise there with all those Favs!! Congratulations Taffy this is an outstanding image!! Woohoo! Congrats on numero uno for the week!!! Congrats on No 1 on the TT this week Taffy. Hopefully a ray of light at the end of a stressful week! @vignouse What a GREAT way to start the day! This is definitely such a thrill -- and I must say, I didn't believe you when you said this was where ti was headed, Richard. Thanks so much for your early vote of confidence! @paulaw So cool to take a break from things, log on, and see my photo at #1. I can't tell you how much of a bright spot it is! Thanks for the kind comment. The top of the Top! Congrats on this amazing capture! Congrats on TT! What a gorgeous photo! This is magnificent. Everything about it-- the colors of the sunset, the rays of light above the cloud, the framing by the trees. FAV for sure! Wow, big congrats on the #1 spot on TT this week, and even though you are not lacking for FAVs let me add mine on to it, as late as it is!! This is truly a magnificent photo, for the framing, for that wonderful light radiating behind those clouds, for the colors and the light! You must be thrilled beyond words, and I hope this eases the transition into your improved digs back in the city! Layers in PS are an interesting and extremely powerful concept, but they do take time to really understand and own!! Funny thing is I work with layers all the time in Autocad, and I thought it would be easy to transition to them in PS, but they are a different animal! Just keep practicing with the concept, and at some point the lightbulb will go off! Missed this one Taffy as have such limited internet access while we are on holiday in Wales. Congrats on #1 TT. Here's another fav! Congrats on TT, this is a stunner Taffy! Congratulations Taffy for not only your incredible photograph making it to the Top Twenty, but the number one position! Congrats on such an amazing #1 on TT!! This has really taken my breath away. I am a beginner at photography and am so inspired by this. Thank you !